One of the few american sounding italian bands, and so convincing that even Vernon Joynson, in his 1988 book The Flashback included them in the US psychedelia section! Circus 2000, from Turin, were formed in 1970 and released late that year both their first album and single (containing italian versions of two songs from the LP). The album had no line-up references on the cover, and many people at the time thought they were an english or american band. It contains ten songs, with a very short running time, with strong californian psych influence and the beautiful female voice of Silvana Aliotta above all. A mediocre album, not representative of the italian style, yet it's regarded by many as a very nice one. I am the witch (also on single in the italian version Io, la strega) is one of the best cuts. 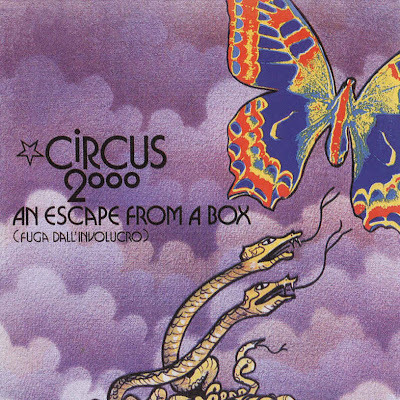 As so many other bands throughout the world had to do, Circus 2000 had to alternate between the most original and inventive material (sung in english) on the LP and more commercial tracks (in italian) on singles, and they released Regalami un sabato sera in 1971 (backed by a very nice Ho regalato i capelli) used in a popular TV series. Second album came in 1972, still in english but with a slightly more polished sound and some progressive influences. An escape from a box is again a very short album, around 33 minutes, but the five songs are longer and the opening Hey man (also released as a single) the best track. After 1973 singer Silvana Aliotta tried a solo career (as Silvana dei Circus 2000) with some singles but the choice proved to be not successful. Original drummer Johnny Betti founded the small Shirak label and formed Living Life along with guitarist Quartarone. The latter was also involved in the Il vangelo secondo Barabba album. Drummer Dede Lo Previte played with Duello Madre, Nova and Kim & the Cadillacs. try. When i do this posts in this time period, ucoz-hosting inserted possibility of some link statistic "u.to", sadly i dont may change this option for this posts, soon after i dont use this service. personal information under false pretenses. We prevented you from loading this page as part of our safer, faster, and smarter DNS service. Learn more about this free service... "
can you please post the open link?